Introduction: What is a playbook? And so there you have it. A marketing playbook defines roles (people) and how to get things done (process and technology). Campaigning is synonymous with marketing. Marketers must run campaigns to generate any level of engagement with customers and future customers to ultimately generate revenue. So, campaigning should be second nature. But unfortunately, many organizations, with great intensions, create chaos by snubbing the painstaking details needed to move a campaign from an idea to implementation, testing and eventually optimization. Of course, at LeadMD, we work with marketers who focus on proving their impact on the business. That requires orderly campaigning. Developing a campaign playbook will create a repeatable process for all your go-to-market campaigns. Using another analogy, picture your campaign playbook as a your grandmother’s famous cookie recipe. What ingredients do you use? What temperature should your oven be? Who will you sell your cookies to? These are just some of the questions you want to ask when cooking but also when you are building a campaign. Here’s a peak into the elements we’ve found every successful campaign playbook needs. We all love the perfectly balanced cookie, a little chewy in the middle yet a nice crisp on the outside! The recipe must be followed to a tee or else you may end up with a charred or salmonella-riddled cookie not quite ready to eat. Same goes for a campaign. Each area of the process will require close attention and intentional execution. Below are the six stages of campaigning, you’ll likely already familiar with, though perhaps terming slightly differently. Let’s outline some of the core questions you’ll ask in each stage. Who is your audience? Think about who you are trying to talk to. What is your budget and timeline? If this campaign is a success, what does that mean to you? We love this article on running a great ideation workshop, whether it’s for this purpose (marketing campaigning) or product or really anything. What are you trying to say; what is your message & CTA? Have you performed your audience and historical research? What aesthetic are you going for and does your messaging match? Who is in charge of what and what is their role? Do you know what assets will speak to your audience? How will you activate your campaign? Do you have a strategy? The copy & the design, what does it look like? Do you have programs & reports built? Are you conducting testing before activating? Who is going to monitor? Were your milestones met at each point of the campaign journey? Did you even establish those milestones? Do you need to adjust? Campaign playbooks and their older brother, marketing playbooks, will all be different and customized to your organization. But examples are often helpful to get closer to a finished product and to know you’re on the right path. To that end, we’ll share a campaign playbook we collaborated with a client to create, specifically with the often missed stage of “Optimize”. The dark gray boxes at the bottom of this screenshot are often missing from playbooks. These are the outputs and next steps for each stage. In a discipline like marketing, which can often be fairly ambiguous, it’s important to align your teams on “done”. That requires alignment on a next step or an output from the stage the team is currently working. An idea is just an idea until you make it happen or fail and try again. With a campaign playbook you have a formulated plan of every step needed to drive a successful campaign. If you have questions or want to chat through your current playbook, leave a note below and we can chat! Joy Martinez is a Sr. Marketing Consultant at LeadMD, a Marketo Certified Solutions Architect, and a five-time Marketo Certified Expert. She’s also a business owner and former podcast host! 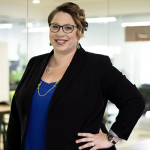 With almost 15 years of experience in marketing, marketing automation and digital marketing, Joy enjoys transforming marketing from good to great and playing a key role in driving organizational success with marketing automation. She’s worked in all kinds of industries from food & beverage (broker and manufacturer), financial services, information security, transportation, and has consulted in dozens of other industries.